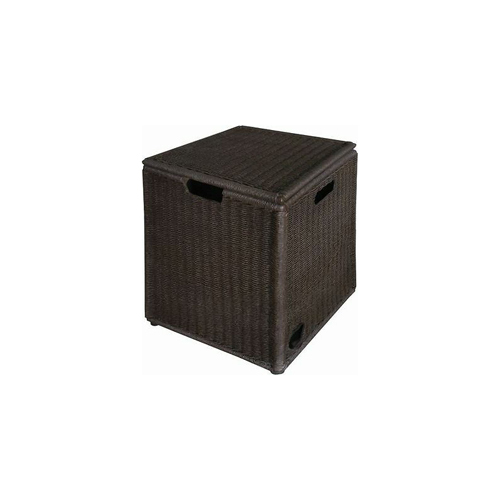 • Box Dimensions: 23.875" x 12.25" x 2.12"
Protect your patio furniture the Armor All way from harsh outdoor elements all year long. This oversized chair cover is made of high grade materials and is tested for strength and durability. Features durable elastic hem along the bottom buckles a handle double stitched bottom seams stylish taupe piping trim and a pocket air vent that reduces condensation and wind lofting. Fits most oversized patio chairs. Watch how it works at BlueRhino.com/ZipItChair . Protects your patio furniture from harsh elements all year long . Zip It feature UV protection treatment and cold crack resistant. 2 secure bottom buckles 1 fabric handle 1 pocket air vent stylish taupe piping trim . 33" x 35" x 36"; Lifetime warranty. Taupe. This item cannot be shipped to APO/FPO addresses. Please accept our apologies. Protect your patio furniture the Armor All way from harsh outdoor elements all year long. This oversized chair cover is made of high grade materials and is tested for strength and durability. Features durable elastic hem along the bottom buckles a handle double stitched bottom seams stylish taupe piping trim and a pocket air vent that reduces condensation and wind lofting. Fits most oversized patio chairs. Watch how it works at BlueRhino.com/ZipItChair . Protects your patio furniture from harsh elements all year long . Zip It feature UV protection treatment and cold crack resistant. 2 secure bottom buckles 1 fabric handle 1 pocket air vent stylish taupe piping trim. 28" x 76" x 30"; Lifetime warranty. Taupe. This item cannot be shipped to APO/FPO addresses. Please accept our apologies. 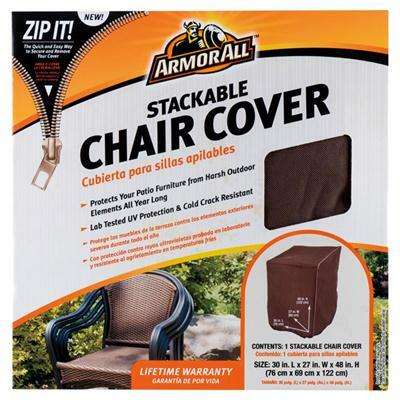 Protect your patio furniture the Armor All way from harsh outdoor elements all year long. This oversized chair cover is made of high grade materials and is tested for strength and durability. Features durable elastic hem along the bottom buckles a handle double stitched bottom seams stylish taupe piping trim and a pocket air vent that reduces condensation and wind lofting. Fits most oversized patio chairs. Watch how it works at BlueRhino.com/ZipItChair . Protects your patio furniture from harsh elements all year long . Zip It feature UV protection treatment and cold crack resistant. 2 secure bottom buckles 1 fabric handle 1 pocket air vent stylish taupe piping trim. 30" x 27" x 48"; Lifetime warranty. Taupe. This item cannot be shipped to APO/FPO addresses. Please accept our apologies. 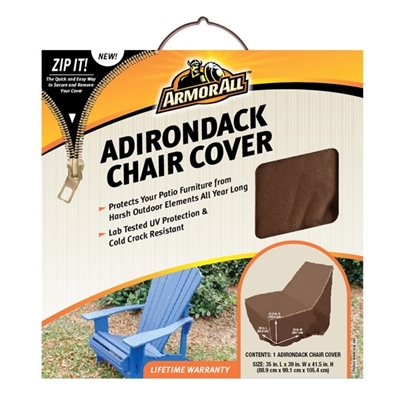 Never go unprotected with the Armor All Adirondack Chair Cover. Using the Zip It feature quickly and easily secure and remove your cover with the convenient zipper that makes zipping it flipping it and dropping it as easy as 1-2-3. This cover is specially designed to guard your patio furniture from the elements all year long and has been engineered and tested for strength and durability. Don?t let the dependability fool you this Adirondack Chair Cover is fabricated with trendy taupe piping trim so your patio will be stylish regardless of the weather. Watch how it works at MrBarBQ.com/ZipIt Elastic Hem for a Secure Fit Durable Handle for Easy Removal Pocket Air Vent for Reducing Condensation & Wind Lofting Double Stitched Bottom Seam for Durability Extra Buckles to Help Secure Cover 35 in. L x 39 in. W x 41.5 in. H (88.9 cm x 99.1 cm x 105.4 cm). This item cannot be shipped to APO/FPO addresses. Please accept our apologies. Protect your grill from elements the Armor All way all year long. This medium grill cover is made of high grade materials and is tested for strength and durability. Features include hook and loop side closures handles and pocket air vents that reduce condensation and wind lofting. Fits most medium grills. Watch how it works at MrBarBQ.com/ZipIt Protects your grill from harsh elements all year long Zip It feature UV protection treatment and cold crack resistant. 2 fabric handles and 2 pocket air vents. Lifetime warranty 58x 25x 45x; fits most medium grills. This item cannot be shipped to APO/FPO addresses. Please accept our apologies. Protect your grill from elements the Armor All way all year long. 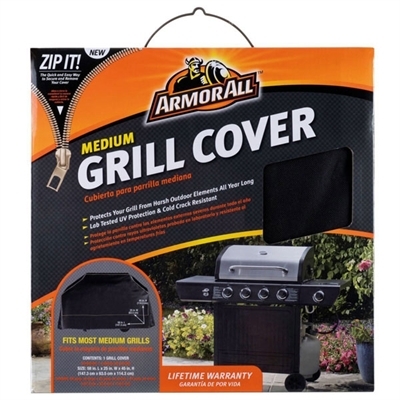 This large grill cover is made of high grade materials and is tested for strength and durability. Features include hook and loop side closures handles and pocket air vents that reduce condensation and wind lofting. Fits most large grills. Watch how it works at MrBarBQ.com/ZipIt Protects your grill from harsh elements all year long Zip It feature UV protection treatment and cold crack resistant 2 fabric handles and 2 pocket air vents. Lifetime warranty 65x 25x 45x; fits most large grills. This item cannot be shipped to APO/FPO addresses. Please accept our apologies. Protect your grill from elements the Armor All way all year long. 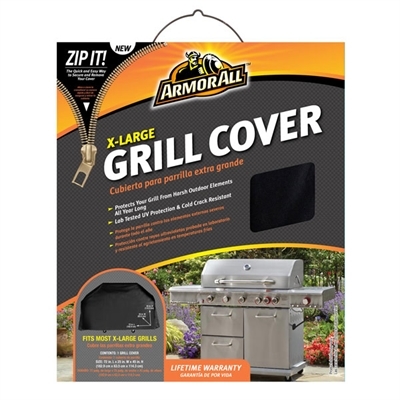 This large grill cover is made of high grade materials and is tested for strength and durability. Features include hook and loop side closures handles and pocket air vents that reduce condensation and wind lofting. Fits most large grills. Watch how it works at MrBarBQ.com/ZipIt Protects your grill from harsh elements all year long Zip It feature UV protection treatment and cold crack resistant 2 fabric handles and 2 pocket air vents. Lifetime warranty 72x 25x 45x; fits most large grills. This item cannot be shipped to APO/FPO addresses. Please accept our apologies. Protect your patio set the Armor All way from harsh outdoor elements all year long. This round patio set cover is made of high grade materials and is tested for strength and durability. Features durable elastic hem along the bottom buckles handles double stitched bottom seams stylish taupe piping trims and pocket air vents that reduce condensation and wind lofting. Watch how it works at BlueRhino.com/ZipItRoundPatio . Protects your patio furniture from harsh elements all year long . Zip It feature UV protection treatment and cold crack resistant. 4 secure bottom buckles 2 fabric handles 2 pocket air vents stylish taupe piping trim. 114" x 72" x 30"; Lifetime warranty. Taupe. This item cannot be shipped to APO/FPO addresses. Please accept our apologies. The only thing better than being able to cover one Adirondack chair is being able to cover two with the Armor All Stacked Adirondack Chair Cover. Using the Zip It feature quickly and easily secure and remove your cover with the convenient zipper that makes zipping it flipping it and dropping it as easy as 1-2-3. 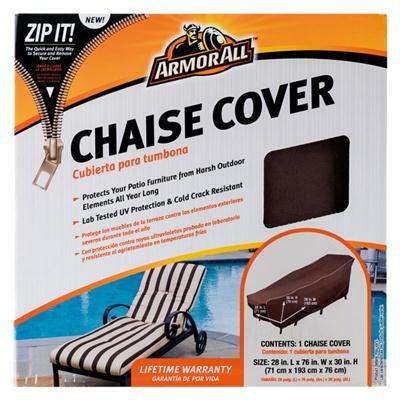 This cover is specially designed to guard your patio furniture from the elements all year long and has been engineered and tested for strength and durability. Don?t let the dependability fool you this Stacked Adirondack Chair Cover is fabricated with trendy taupe piping trim so your patio will be stylish regardless of the weather. Watch how it works at MrBarBQ.com/ZipIt Elastic Hem for a Secure Fit Durable Handle for Easy Removal Pocket Air Vent for Reducing Condensation & Wind Lofting Double Stitched Bottom Seam for Durability Extra Buckles to Help Secure Cover 45 in. L x 35 in. W x 42 in. H (114.3 cm x 88.9 cm x 106.7 cm). This item cannot be shipped to APO/FPO addresses. Please accept our apologies. The Asheville Tank Hideaway is the perfect accent piece for your outdoor dining area. Both aesthetically pleasing and functional, this unit offers a charming way to conceal your external liquid propane tank, while doubling as a convenient end table. Your guests will never know what you are hiding in the attractive Asheville Tank Hideaway. Bring back the old days with this colorful steel settee. Every bench is made of powder coated steel with weather resistant paint 10 blue bench with flower design. Blue This item cannot be shipped to APO/FPO addresses. Please accept our apologies. Bring back the old days with this colorful steel settee. Every bench is made of powder coated steel with weather resistant paint 10 blue bench with flower design. Red This item cannot be shipped to APO/FPO addresses. Please accept our apologies. Bring back the old days with this colorful steel settee. Every bench is made of powder coated steel with weather resistant paint 10 blue bench with flower design. Yellow This item cannot be shipped to APO/FPO addresses. Please accept our apologies. This steel bird bath is decorative yet functional and comes with a resin hummingbird accent 1- Bronze powder coated finish.Black This item cannot be shipped to APO/FPO addresses. Please accept our apologies. This steel bird bath is decorative yet functional and comes with a resin bird accent 1- Bronze powder coated finish . Black This item cannot be shipped to APO/FPO addresses. Please accept our apologies. This storage solution looks like furniture but lasts like Rubbermaid. Stylish basket weave pattern complements dTcor and other outdoor furniture. There is plenty of storage space inside for patio seat cushions garden supplies or toys. Holds 24-inch seat cushions . The lid offers a flat surface area for serving or seating space . Made of weather-resistant material that protects stored items your things from sun rain and snow. This item cannot be shipped to APO/FPO addresses. Please accept our apologies. This storage solution looks like furniture but lasts like Rubbermaid. Stylish rattan pattern complements dTcor and other outdoor furniture Plenty of storage space inside for patio seat cushions garden supplies or toys. The lid offers a flat surface area for serving or seating space . Made of weather-resistant material that protects stored items your things from sun rain and snow . This item cannot be shipped to APO/FPO addresses. Please accept our apologies. Beautiful Doyle 3 piece bistro set allows for a quiet seating area in any yard 1- Includes 1 table and 2 chairs.Copper This item cannot be shipped to APO/FPO addresses. Please accept our apologies. Handmade in steel from an original design and hand-rusted, this whimsical dragonfly is a garden pick, a unique addition to urns or other planters not only in your garden but in your house. 73 gal. Medium Resin Deck Box with Seat Heavy duty plastic resin is maintenance free Weather-resistant construction for longevity . Safely stores pool chemicals yard toys or other small items . Top doubles as sturdy bench seat with double wall construction Lockable (lock not included) This item cannot be shipped to APO/FPO addresses. Please accept our apologies. Convenient storage option for almost anywhere. Best for small balconies patios porches decks and other limited spaces this tough little deck box adds storage almost anywhere you need it. 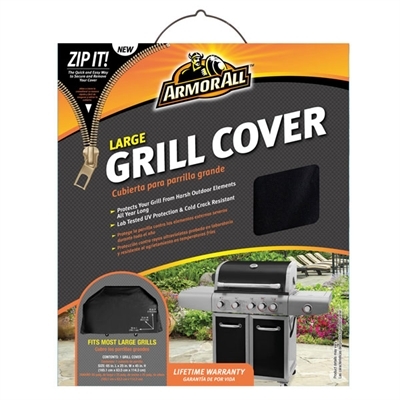 Perfect for small grill supplies and outdoor tools Snap-tight lid keeps items protected from the elements Durable double-wall construction resists leaks dents and moisture. Will not rot or rust like wood and metal deck boxes Easily assembled in minutes. This item cannot be shipped to APO/FPO addresses. Please accept our apologies. This steel park bench is constructed of powder coated steel for added durability in a lovely black finish to complement any dTcor 1- Features a stunning bird motif.Black This item cannot be shipped to APO/FPO addresses. Please accept our apologies. The Rubbermaid Patio Cabinet features a basket weave pattern to complement your decor. An extra-large storage space inside holds seat cushions garden supplies and grilling accessories. There is an adjustable shelf included. Lockable for extra security. lock sold separately . Cabinet is made of weather resistant plastic resin that will protect your things from sun rain and snow . Top level surface provides entertaining space . Full-length double doors. This item cannot be shipped to APO/FPO addresses. Please accept our apologies. Catching the sun's rays by day, our sweet NEW Solar Tea Lantern lights up by night to cast a warm romantic glow from within. Clean and quaint each hand-blown glass lantern is embedded with a combination of luminescence and white glass. Unlike other solar lights, this lantern utilizes a "warm white" LED, for a natural, inviting glow. For instant ambiance, add a little romance to every evening enjoyed outdoors! This is a statement for any backyard - 76" Jumbo kinetic owl garden stake 1This kinetic owl will be the centerpiece of any landscape 2-76" high with a 56" wing span this jumbo owl rocks in the wind and adds a touch of whimsy to every garden.Brown This item cannot be shipped to APO/FPO addresses. Please accept our apologies. Stonehill wicker chairs offer a durable and comfortable way to relax at home. 1)Resin wicker chair with powder coated steel frame 2)Polyester cushion . Brown Red This item cannot be shipped to APO/FPO addresses. Please accept our apologies. This 3 piece resin wicker seating group with cushioned swivel glider chairs offers superior comfort 1-Includes 2 swivel glider chairs and a side table made with sturdy steel frames 2-The chairs come with a comfortable thick 4" cushions covered in a striking red outdoor material . Brown Red This item cannot be shipped to APO/FPO addresses. Please accept our apologies.